The State Science and Technology Awards ceremony was held at the Great Hall of the People in Beijing on the morning of January 8th. 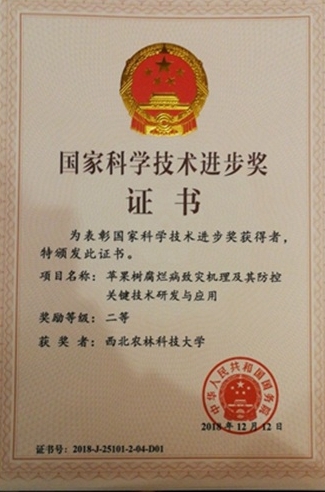 “Disaster-causing Mechanism and Development and Application of Major Prevention and Management Technology of ValsaCanker on Apple”,an NWAFU-affiliated project whose first author is Professor Huang Lili from the College of Plant Protection, won the State Science and Technology Second Award. In recent years, NWAFU has centred the need of the Three Rural Issues and has been oriented to the regional economic and social development. Science and technology havereceived constant improvement, and major research results continuously spring up.